Saturday I was in NY Cake certainly one of the most, if not the most, well stocked cake and baking supply store in New York City. They have everything you can imagine and a lot of stuff you can’t for making all sorts of very fancy cakes. In addition to bake ware they also sell bulk chocolate in all sorts of colors from dark, milk, and white to Pink, Red and Blue. Visiting is like a vacation in Disneyland for bakers. I was looking for flan/tart rings and lingering in the aisles over all the amazing things when I came across these measuring spoons pictured above. First of all can you please tell me the last time you have a recipe that called for a smidgen? 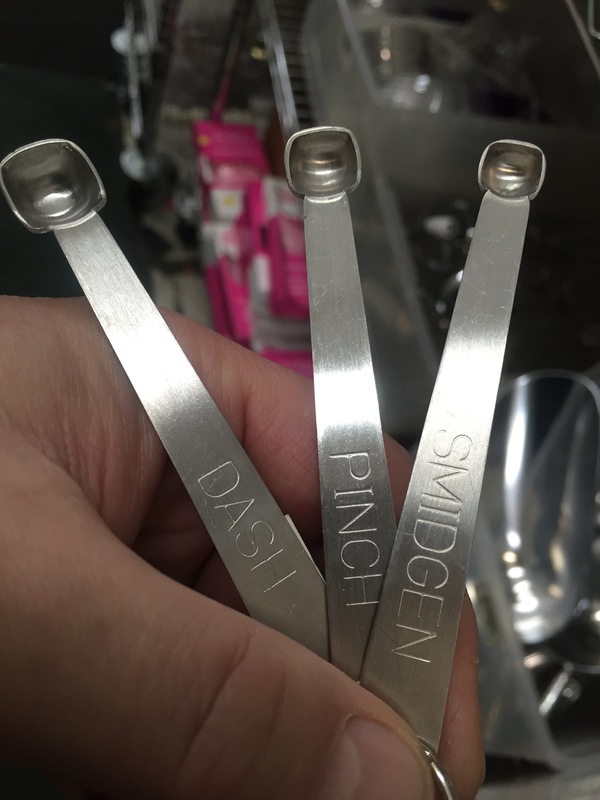 Who is qualified to quantify what makes a dash different that a smidgen or a pinch? Is this really a thing? And aren’t they all so small as to be kind of moot? I mean if you add a pinch not a smidgen will the entire recipe be ruined? The only thing I can think of that this might apply to is hot pepper, my gut tells me there are not a lot of Red Velvet Cayenne Pepper cake recipes out there. Can anyone think of another reason, or any reason you would need this? Does anyone own these? Does anyone think they are a good idea? Please leave your thoughts in the comments section! This entry was posted in NYC, Other Stuff and tagged Dash Pinch Smidgen, humor, Measuring spoons, NY Cake, useless things, wastes of money. Bookmark the permalink. I think these are just a cutesy gag gift for the chef who already has everything (like you!). Probably, I just worry there are people out there who might take them seriously! What Michael said. You’ll be getting a dozen sets for your next birthday, UFG!